This week on Medieval Monday I’m delighted to share an excerpt from Barbara Bettis’ The Lady of the Forest. Paxton already must have arrived to spread his lies. Damnation. “This has all been a mistake,” he insisted. “You might well think so.” She edged closer as they spoke. When her elderly husband dies, Lady Katherine fakes her own death and disappears into the forest with others escaping the brutish new lord. Determined to protect her people, she knocks the wrong man senseless. But Lord Henry isn’t an enemy, he’s the brother of her childhood friend. Although his tender confidence tempts her, she’s bound by duty. Henry of Chauvere has found the one lady he wants for his own, never mind she’s tied him hand and foot. When he learns the king has ordered her to wed Stonehill’s ruthless new master, he insists Kate seek haven with his sister. But she won’t desert her friends. Henry vows to solve her problem, provided he catches a traitor before the threat from Kate’s past catches her. Words to stir anyone’s heart. In this case not from Tom Hiddleston (I keep hoping) but the librarian at Macclesfield Library where I do my Tuesday morning writing session. She asked me if I would be interested in taking part in the Romance on the Road campaign organised jointly by Mills & Boon, The Reading Agency and the Mobile Library Service. Mills & Boon have had a long involvement with mobile libraries but I didn’t know until I started looking into the campaign that Charles Boon, one of the founders, worked in a mobile library before going into partnership and starting the publishing house. With all that in mind, and the chance to spread the Mills & Boon love for Valentine’s Day, how could I resist! As a result, earlier this week found me out bright and early in Cheshire , heading down country lanes that got smaller and more twisty to meet up with Jon and the mobile library. While over 70 mobile libraries are taking part in the event around the country, Cheshire East has been chosen to be one of the ‘Fabulous Five’ with stickers, balloons,sashes for the driver, and gifts to give out to library users. There was a sticker on the front too! Our first rendezvous was in the car park of the Badger Inn Church Minshull . I waited, hoping I was in the right place and before long the car park had filled up with a group of eager readers, waiting with piles of books. I can imagine that if I lived there the tri-weekly visit would be a real highlight for me. I was excited even waiting once! The library van arrived decorated with stickers and a poster with my books in the window, the doors slid open and in we went to be greeted with bunting and shiny pink padded envelopes. Church Minshull residents joining in a photo opportunity – thank you all. I had taken along some of my books to discuss and the villagers were particularly impressed with the cover of The Blacksmith’s Wife, especially when I mentioned I had asked for Aidan Turner as the cover model. They told me that inspired by the recent BBC adaption of Poldark, the village had got together and created a calendar featuring village men in Poldark-y poses. So far they’ve raised over £2000 which is incredible! It was wonderful to meet such an enthusiastic crowd and I’m half tempted to move there, if only so I can join the ballroom dancing class! If you’re wondering what I’m holding in the photos, they’re Valentine’s gifts that Mills & Boon had sent along. I had a box of packages waiting for me inside the library. It was very hard not to peek to find out which books were inside! The residents of Church Minshull went off for their regular post-library coffee in the pub while I looked on enviously. While we waited for time to leave, we made a display of some of the copies of Mills & Boon titles that were in the library van. Some of the Mills & Boon titles that were in the library. Have you read any of them? Our next stops were at the two ends of Home Farm Park in Lea where we met residents who live on the park permanently (I was super impressed with Jon’s ability to reverse park in such small spots). It was a warm, sunny day so it was nice to stand around with light streaming in through the library door and be able to chat to borrowers (of library books, not small people living under the floorboards). One of the visitors told me her daughter lives just outside Macclesfield and is a keen reader of historical so I was pleased to be able to give her a copy of The Saxon Outlaw’s Revenge which is set in the area. We spent some time discussing our favourite historical authors and browsing the shelves (the library is impressively stocked with something to suit everyone- a real TARDIS). Jon with his special pink sash in the background. I recommended my favourite author and managed to pick up a copy of a book I’ve been searching for in the process (well I couldn’t spend a morning in a library and not leave with something). The van had to move on to the next stop and I needed to get back to carry on writing my new story. Before I said goodbye I did get to wear the sash that I had been coveting since I arrived. The closest I’ll get to being Miss World! The van goes out on three-weekly timetables around villages in Cheshire. The promotion is running until the 14th February and there are still plenty of gift bags to collect before Valentine’s Day itself so keep an eye out for the van with pink stickers heading your way! Thank you Cheshire East Libraries for inviting me along. I had a lovely morning and it was great to see how well the library was used. I’m lucky to have always lived in towns where there is a library and made great use of it, from nipping in on the way home from school as a teenager to fill in time before the bus (and often missing the next as a result of getting absorbed in a book) to taking my own young children as welcome moment of sanity amid sleepless nights and PND. Not everyone is so lucky to have a library on their doorstep and the Mobile Library Service provides a wonderful way of accessing books for those living too far to get to one regularly. With funding cuts and libraries being threatened increasingly with closure, keeping services like this going will be so important to people living in more isolated areas. Libraries, exploring and Mills & Boon- three of my favourite things in one day! The Reading Agency is a charity whose aim is to inspire more people to read. They do a superb job of encouraging people of all ages to pick up a book and targeting groups who might not have access otherwise. You can find out more of what they do here. It’s the season of romance (unless you’re cynical and Northern like me). To celebrate Valentine’s Day Harlequin are running a giveaway with a difference. All the authors taking part are giving away a copy of one of their own books and a secret surprise title by another author. I’m giving away a copy of The Saxon Outlaw’s Revenge and I’ll give you a clue to my secret book-it’s by one of my fellow Unlaced Ladies – all Harlequin Historical authors who manage The Unlaced Book Club where we discuss writing, inspirations and anything else that takes our fancy with a historical or romantic theme. The giveaway runs for the whole of February. Lucky it’s a short month so you won’t have to wait for too long to find out if you’ve won. You can enter the giveaway here or by clicking the picture and find details of other authors taking part with the hashtag #HarlequinSecretValentine on Twitter. We’re nearing the end of the celebration theme (a new one with some exciting changes is coming soon) so I’m pleased to be able to share this excerpt by Rue Allyn from Knight Defender. I love being able to share excerpts from such wonderful authors. Today I’m sharing Bambi Lynn’s Marek. Boring accountant, Kitty Petty, struggles to get through each day one at a time since the brutal murder of her husband. She spends every free moment caring for her young daughter, until the night she wakes to find her bed on fire. Kitty doesn’t know how she got to the year 1196, much less how to get back. But if she doesn’t, her daughter will be institutionalized. Having failed to save her child from the clutches of a madman. Kitty vows to protect her future. But going back to her time means risking her own life and separating her from the knight she has grown to love. Marek Stone wants to protect his wife from the people of Stonebridge. Katherine has been declared a demon after her miraculous rise from the funeral pyre, and the villagers want justice. Kitty doesn’t know how she got to the year 1196, much less how to get back. But she must if she has any hope of saving her daughter. However, the knight who loves her will do anything to make her stay. Marek’s family sat with them, although Bryn sat at one of the trestle tables, a better vantage point for grabbing the backside of every passing serving girl. As she looked around the great hall, Kitty thought every villager in Stonebridge must be in attendance. Many had never been to a feast as grand as this. There was no corn or sweet potatoes, but Vale and Bryn had managed to hunt down a flock of birds remarkably like turkeys. There was no end to the bread stuffing, gravy, even stewed cranberries. Kitty herself had been guiding the cooks for a week to prepare enough food for everyone. They had even baked over one hundred pumpkin pies for dessert. Marek reached over and squeezed her hand. When she handed him the portable Play Station, he looked at her like she might indeed be from the devil. Kitty smiled. “It’s a game. Watch.” She pushed the little machine beneath the table and away from prying eyes. Kitty left Thane to the wonder of electronic video games and moved to sit next to Remi. He looked at her skeptically, but over the last few days, his animosity towards her had dimmed some. She reached into her bag and pulled out a portable DVD player. She had already loaded the Robin Hood movie. Adin and Vale were enveloped in ladies, so Kitty decided their gifts could wait. Vale would not need his bullet-proof vest for several months yet. Adin would have years to perfect his technique with help from the pristine copy of The Karma Sutra she’d gotten him. “What is this ‘renaissance’?” Marek asked. I’m delighted to be taking part in Medieval Monday where each week (guess which day) I’ll be sharing a cover and excerpt from a different medieval novel. The overall theme is ‘celebrations’ and I’m starting off with ‘Hearts Across Time’ by Sherry Ewing. The golden sun began to peek over the ocean horizon, splashing the morning sky with a thousand shades of pink and orange. The further it rose, the more color splattered across the cloudless sky until all traces of the earlier shades vanished. ’Twas obvious, the perfect day was a gift from the heavens and a priceless tribute to the woman Riorden would call his wife for the rest of his life. Riorden was in no rush to head down to the Great Hall. There was no need. Katherine and her ladies had insisted ’twas bad luck to see the bride afore the wedding. He had never heard of such a custom, but who was he to tempt fate? Nay, he dare not look upon her, if such an occurrence would displease God, and in His wrath, He would wrench Katherine back from whence she had come. Patrick brought Riorden a small repast, along with water to wash and fresh garments Lynet had lovingly sewn for his wedding. He was not surprised when he saw the tunic. Gilded fabric had been embroidered and used as trim on the deep blue cloth Katherine herself had chosen, saying the color would match his eyes. He smiled, wondering how she would look in the golden material he had chosen for her. He supposed, he would find out soon enough. A knock roused Riorden from his musings of his lovely lady. Opening the door, he saw Aiden standing there, also dressed in his finest. “What…no sword?” Riorden inquired in jest. He also was to leave his sword within his chamber, although he stowed a small, serviceable blade in his belt. “Then let us be on our way, since I am all but done here,” Riorden said, and they made their way up to the third floor. He had just taken the last step on the tower stairs, when he halted his progress to peer down the passageway toward Lynet’s chamber. Intent on listening to the bubbly laughter of his soon to be wife and her friends, he began to hear a strange haunting melody, most likely coming from the machine Kat called a cellphone. She was so close, and he found he had missed her company this past eve, more than he would have thought possible. He took a step in the direction towards where, in his heart, he wanted to be until he felt Aiden tugging at his arm. Bestselling author Sherry Ewing presents this special edition box set getting 5 star reviews that is combining Katherine and Riorden’s complete story from For All of Ever and Only For You in Hearts Across Time: The Knights of Berwyck, A Quest Through Time Novel (Books One & Two). For All of Ever: Katherine Wakefield has dreamed and written of her knight in shining armor all her life. Yet, how could she have known that when she and her three closest friends take a dream vacation to England that they’d find themselves thrown back more than eight hundred years into the past? Riorden de Deveraux travels to Bamburgh answering the summons of King Henry II. But nothing prepares him for the beautiful vision of a strangely clad ghost who first appears in his chamber. Centuries are keeping them apart until Time gives them a chance at finding love. Will the past of one consume what their future may hold, or will Time take the decision from them and hurdle Katherine forward to where she truly belongs? Only For You: Katherine de Deveraux has it all but settling into her duties at Warkworth Castle is not easy and downright dangerous to her well-being. Consumed with memories of his father, Riorden must deal with his sire’s widow. Yet how could he know how far Marguerite will go to have the life she feels they were meant to live? Torn apart, Time becomes their true enemy while Marguerite continues her ploy to keep Riorden at her side. With all hope lost, will Katherine & Riorden find a way to save their marriage? Harlequin are running a contest to find the Harlequin Hero of the year. The hero has to appear in a book published between October 2014 and September 2015 which means both Hugh and Will are eligible. The top sixteen heroes will face off to find hero of the year (and who wouldn’t want to watch those scenes acted out) and it would be lovely to see a Historical hero in the mix. If you’ve enjoyed my books and think Hugh or Will have what it takes please nominate them. You can Vote here by leaving a comment or tweet to Harlequin Books using the hashtag #HarlequinHero including the name of the hero, book and author. Nominations end on September 20th. I’ve been visiting various blogs to talk about A Wager for the Widow (and other things). Here are a couple of the interviews I’ve done. There will be more to come over the next week or so. 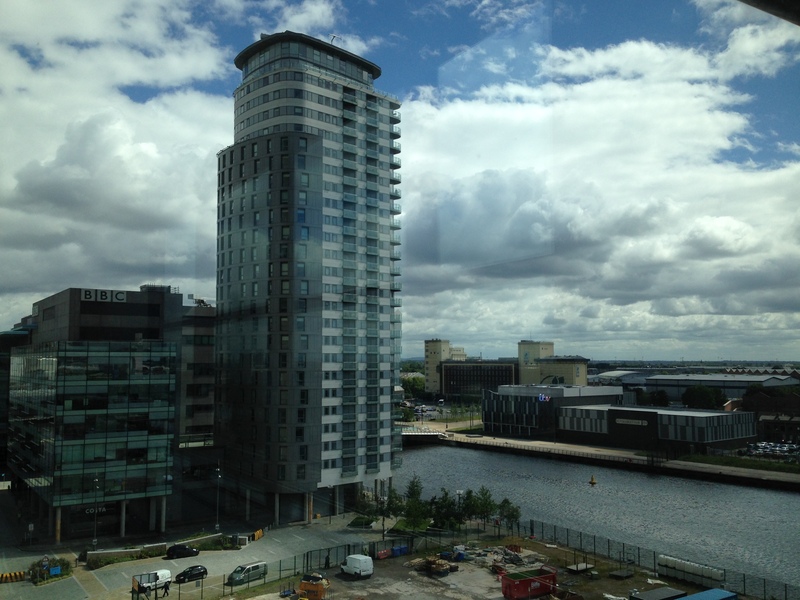 Release date is getting closer so yesterday I paid a visit to Media City in Salford to talk to Becky Want on BBC Radio Manchester about A Wager for the Widow. 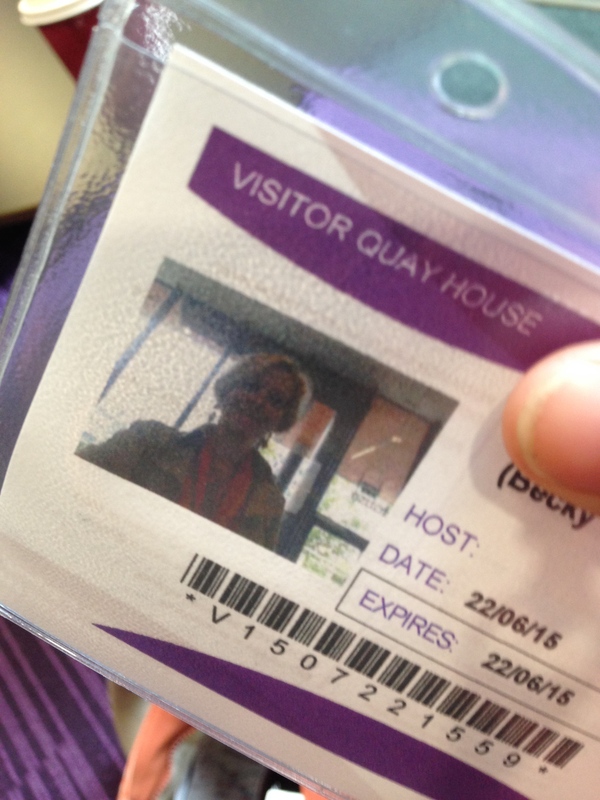 Flattering photo on my ID card. I had a case of nerves before I went on air and I’m not sure the coffee helped but I enjoyed sitting in Costa beforehand and trying to work out if the man at the next table was famous. This is the interview. I haven’t listened to it all as I never like hearing myself but I think it went well. I managed to remember the names of the characters (thanks to a crib sheet) and had a fun time. Becky was a great host. My friend very kindly (and cleverly because I wouldn’t know where to begin) recorded the interview as an MP3 for me. I love the area round the quays and for a change the weather was nice enough to go for a wander around. 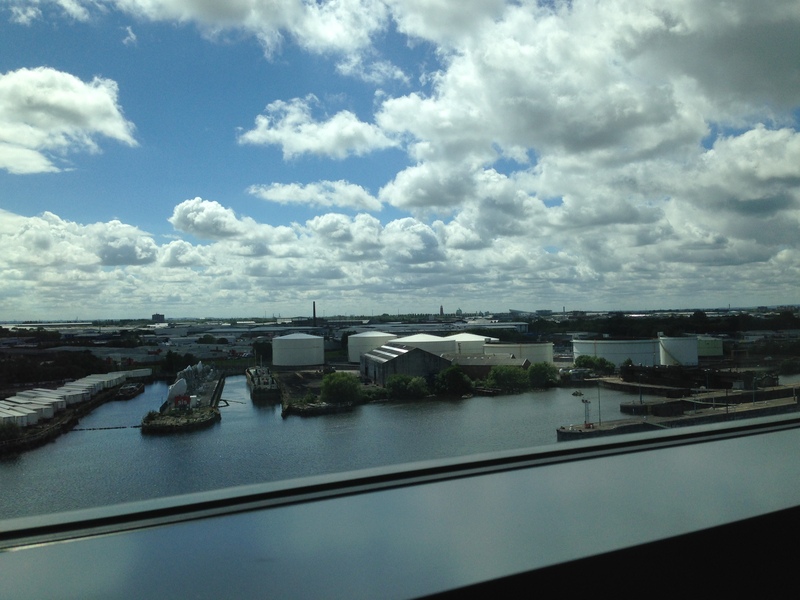 The views from the multi-storey are great, taking in most of Salford and outer Manchester. BBC one side. ITV the other. I wonder if the staff give each other hard stares as they look out of the windows? Fabulous view from the car park.